Is the sunbed a Gianus Bifrons (two-headed god)? 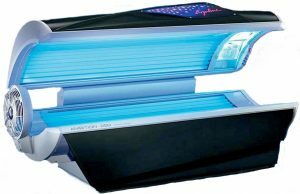 Recent research comes to the conclusion that indoor tanning is a Gianus Bifrons, which is interpreted as a two-headed god. One head, according to these researchers, is an increase in various skin cancers (a dubious claim). The other head is the ability of sunbeds to produce large quantities of vitamin D, increasing serum vitamin D concentrations up to two fold. In addition, this increase in vitamin D, they believe, could lead to a decrease in myriad diseases. The authors of the paper state the following: “Therefore, some favorable effects [of tanning beds] against the risk of developing many human diseases, including non-skin cancers, cannot be excluded at first glance, although they may not be only linked to [higher] vitamin D status.” They also go on to suggest that more research should be performed to determine if the unfavorable effects of indoor tanning on skin cancers may be outweighed by the favorable benefits of amelioration of low vitamin D levels. This research ignored many research studies showing that regular, non-burning sun exposure is protective against melanoma. In my upcoming book, Embrace the sun, about 14 different research studies are cited. All of these studies demonstrate a positive effect of sun exposure. There are also positive effects of sun exposure and sunbed exposure, beyond the ability to produce vitamin D. Nitric oxide (NO) is produced by both. NO is a vasodilator that lowers blood pressure and reduces the risk of heart disease. Perhaps the most important study to differentiate between the positive effects and negative effects of sunbed exposure is this one: A 20-year Swedish study demonstrated that women who used sunbeds were 23% less likely to die from any cause than women who did not use them. This study also showed no increase in melanoma after the 20-year period. So, what more do we need to know about the pros and cons of sunbed use? Sunbed use reduces the risk of type 2 diabetes. Sunbed use controls psoriasis and eczema. Sunbed use may help unborn children. Sunbed use reduces the risk of clots. Sunbed use is associated with lower breast-cancer risk. Sunbed use reduces the risk of death. Lindqvist PG, Epstein E, Landin-Olsson M, Ingvar C, Nielsen K, Stenbeck M, Olsson H. Avoidance of sun exposure is a risk factor for all-cause mortality: results from the Melanoma in Southern Sweden cohort. J Intern Med. 2014 Jul;276(1):77-86. study?, Diabetes Res. Clin. Pract. 90 (2010):109-114. New research states that sun avoidance is killing us! By Marc Sorenson, EdD, promoting sun exposure.. It is no surprise that sun exposure saves lives. Here are a few facts that I have written about on the Sunlight Institute site. Go to news and search the fact you would like to read. As sun exposure in the U.S. has DECREASED by 90% during the last century, melanoma incidence has INCREASED BY 3,000%. A Spanish study shows that women who seek the sun have one-eleventh the hip fracture risk as those who avoid sun. Men who work outdoors have half the risk of melanoma as those who work indoors. Women who totally avoid the sun have 10-times the risk of breast cancer as those who embrace the sun. Sun exposure increases nitric oxide production, which leads to a decrease in heart attack risk. Vitamin D, the sunshine vitamin, is essential to human survival, and sun exposure is the only natural way to obtain it. Sunbathing can produce 20,000 units of vitamin D in 20 minutes of whole-body exposure. Sun exposure dramatically improves mood through the production of serotonin and endorphin. Beyond vitamin D, sun exposure also stimulates the production of endorphin, nitric oxide and BDNF, all of which are vital to human health. Regular sun exposure also reduces high blood pressure, psoriasis and multiple sclerosis (MS). So enjoy your sunshine, but don’t burn. Lindqvist PG, Epstein E, Nielsen K, Landin-Olsson M, Ingvar C, Olsson H. Avoidance of sun exposure as a risk factor for major causes of death: a competing risk analysis of the Melanoma in Southern Sweden cohort. Both vitamin D and Sun Exposure suppress Inflammatory Bowel Disease. Inflammatory bowel diseases (IBD) include diseases such as Crohn’s disease and ulcerative colitis. Like multiple sclerosis, lupus and rheumatoid arthritis, they are autoimmune diseases that cause the immune system to attack its own tissue, in this case the tissues of the digestive system. This may cause extreme distress and damage. Recent research shows that the IBD is associated with both sun exposure and vitamin D deficiency. In experimental IBD, vitamin D positively influences gut epithelial cells, innate immune cells, T cells, and the microscopic organisms that live in the gut. Separately from vitamin D, there is some scientific work that demonstrates that ultraviolet radiation (UVR), a component of sun exposure, can independently reduce IBD cells. Of course, we know that the natural way to obtain vitamin D is through sun exposure, so to me it appears that sun exposure, or sunlamp exposure, when available is the best method of suppressing the disease. Of course, proper nutrition is also imperative. Many previous investigations have shown the remarkable positive influence of sun exposure on IBD. In a 12-year year investigation of hundreds of thousands of IBD patients, hospitalizations and prolonged hospitalizations were higher among those who had low sun exposure compared to those with very high sun exposure. The same relationship was shown between sun, bowel surgeries and deaths; more surgeries were needed for those patients who experienced the lowest sun exposure compared to those who had the highest sun exposure, and more deaths occurred among those with low exposure. An interesting side note to this investigation was that a large number of non-IBD patients were also analyzed for sun exposure amounts. The same relationship existed as with the IBD patients; low sun exposure was associated with prolonged hospitalizations and more deaths when compared with high exposure. There is other research involving the association of Crohn’s disease to sun exposure, which, as above, found that surgery for the disease was significantly reduced among those patients who received more sun exposure. It has also been shown that in the US, there is a north-south gradient for IBD,    meaning that the risk of developing IBD is significantly lower for the southern latitudes (where sun exposure is greater). So for a healthy gut, sun exposure plays a vital role. Be sure to get some sun exposure daily when available. That way, you will obtain your vitamin D, along with other photoproducts that may protect you from IBD as well as myriad other diseases. Bora S, Cantorna MT. The role of UVR and vitamin D on T cells and inflammatory bowel disease. Photochem Photobiol Sci. 2016 Sep 8. [Epub ahead of print]. Limketkai BN, Bayless TM, Brant SR, Hutfless SM. Lower regional and temporal ultraviolet exposure is associated with increased rates and severity of inflammatory bowel disease hospitalization. Aliment Pharmacol Ther. 2014 Sep;40(5):508-17. Kappelman MD, Rifas-Shiman SL, Kleinman K, Ollendorf D, Bousvaros A, Grand RJ, Finkelstein JA. The prevalence and geographic distribution of Crohn’s disease and ulcerative colitis in the United States. Clin Gastroenterol Hepatol. 2007 Dec;5(12):1424-9. Sonnenberg A. Similar geographic variations of mortality and hospitalization associated with IBD and Clostridium difficile colitis. Inflamm Bowel Dis. 2010 Mar;16(3):487-93. It is becoming increasingly obvious that lack of sleep is a major risk factor for human health. In a recent study reported in the journal Sleep Medicine,[i] 2579 adults without metabolic syndrome, were assessed for sleep habits for 2.6 years to determine their risk of developing metabolic syndrome, also known as Met S. Met S is a group of metabolic disorders (high blood pressure, abdominal obesity, high cholesterol, high triglyceride levels, low HDL levels and insulin resistance) that are linked to increased risk of cardiovascular disease and type 2 diabetes. The participants were aged between 40 and 70 years. Indeed, Lack of sleep can be deadly. Forbes Magazine online ran an excellent article on sunlight and sleep,[ii] in which they stated the following statistics: “In 2012, 60 Million Americans filled prescriptions for sleeping pills, up from 46 million in 2006.” The article discusses the potential dangers of sleep medications, showing that those who take 18 pills per year have a tripling of the risk of death compared to those who take fewer than that 18. It then describes the results of research showing that people whose workplaces have windows are able to sleep about 46 minutes per night more than those who have no natural light access. Those who had more exposure to sunlight also were generally happier, had fewer ailments and experienced better vitality than their counterparts without windows. Many individuals have difficulty sleeping long and soundly enough to feel refreshed. A study by Dr. Julie Gammack exposed test subjects to 30-60 minutes per day of direct sunlight, and according to the Saint Louis University health web site, “Nursing home patients who were exposed to natural light had improved sleep quality, less difficulty falling asleep, fewer episodes of wakefulness during the night and greater satisfaction with the amount of sleep they got.”[iii] Other research by Dr. Ayoub and colleagues in Alexandria, Egypt demonstrated that there were several factors associated with insomnia among the elderly. [iv] Having five or more diseases was associated with a 7.5 times increased risk, anxiety was associated with a 1.9 times increased risk, and depression with a 1.74 times increased risk. There was only one factor that reduced risk. Sunlight exposure was associated with 43% reduced risk. Likely, this was due to the production of serotonin and melatonin due to sunlight exposure (see the last paragraph. Other research has shown that sleep disturbances are more common in sub-arctic areas during the dark time of the year. [v] The message? If one wants to sleep well, sunlight exposure during the day is imperative. This research on windows is particularly interesting because the effects of sunlight in that case could have had nothing to do with vitamin D, since the sunlight exposure came through windows, which block the UVB light that produces vitamin D. It is likely that the positive effects of sunlight in this case were produced by increasing serotonin levels (a natural mood enhancer) in the brain during the sunlight exposure, and then allowing melatonin (a natural relaxer) during the night. Lack of sleep is a common, and perhaps deadly, malady. The sun is not our enemy, but a vital friend. Embrace it, but do not burn. [i] Jang-Young Kim, Dhananjay Yadav, Song Vogue Ahn, , Sang-Baek Koh. A prospective study of total sleep duration and incident metabolic syndrome: the ARIRANG study. Sleep Medicine 2015;16:1511-1515. [iii] Gammack, J. Quoted in Medical News Today, April 10, 2005. [iv] Ayoub AI, Attia M, El Kady HM, Ashour A. Insomnia among community dwelling elderly in Alexandria, Egypt. J Egypt Public Health Assoc. 2014 Dec;89(3):136-42. [v] Bratlid T, Wahlund B. Alterations in serum melatonin and sleep in individuals in a sub-arctic region from winter to spring. Int J Circumpolar Health. 2003 Sep;62(3):242-54. Let’s revisit the need for appropriate nutrition in preventing melanoma death.